If you’re working on a constant basis with a large number of photos, you can’t really afford to waste time by going through them one by one. In this case it’s best to resort to an app that can batch edit photos and implicitly make your editing tasks significantly easier. 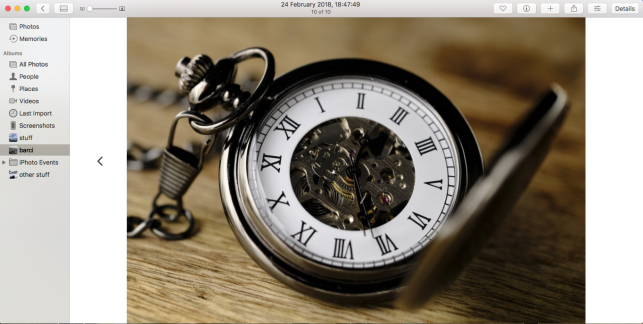 Your Mac comes by default with some useful apps you can put to use to increase productivity, and Photos is definitely one of them. Photos is not a batch editor per se, but offers a workaround through the Copy Adjustments tool so you don’t have to edit images one by one. Let’s say you want to improve the overall appearance of your images shot today in the park by adjusting things like brightness, color, sharpness and white balance. With one of the images in Edit mode, apply all the desired edits to it. Then, once you’re done, go to Image > Copy Adjustments. Next use your arrow keys to step to the next photos, remaining in Edit mode. Last, go to Image > Paste Adjustments and the app will apply all the changes you made to the first picture. This workaround does help you apply the same adjustments to a group of photos, but it doesn’t include operations like crop and rotation. Furthermore, it’s not as fast and as effective as using an app particularly designed to handle batch processing. 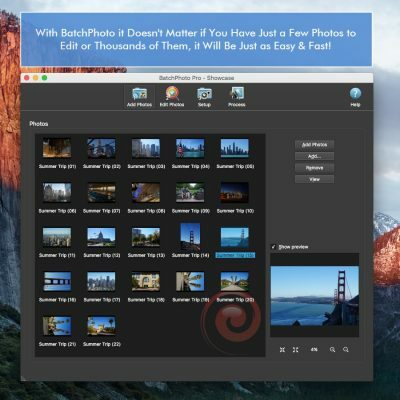 BatchPhoto is a tool specially built for batch editing images on a Mac. The app comes with a simple and intuitive interface, which makes it easy to use from the get-go. Basically, it’s conceived as a three-step wizard: you add your photos, apply the desired edits and select the format and the output folder. What can you do with it? Well, BatchPhoto offers a wide range of edits which you can apply to your images in bulk. You can optimize your photos by resizing, converting, cropping or rotating them, brand them with a logo or text watermark, add a date and time stamp, retouch them by adjusting the brightness, contrast or saturation, apply special effects like sepia, black and white or oil paint or decorate them with vintage frames. BatchPhoto has a couple of additional features designed to boost productivity. For instance, you can save your current settings as Profiles and easily use them again later without having to go though the same process. Furthermore, the app comes with a smart Folder Watch option. What it does is monitor folders on your Mac, network or website and every time new images are being added, it automatically applies a set of edits you previously defined. In addition to saving the edited images on your Mac, you can also directly upload them to Facebook, Flickr or your FTP account. 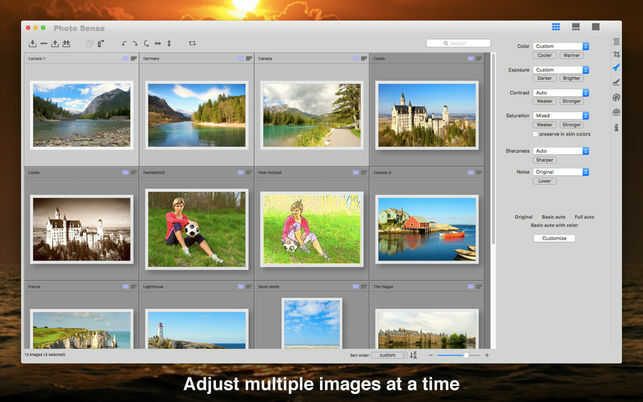 Photo Sense is not your standard Mac image editor. This app is different from the others, since it focuses on automatically making your images look better. 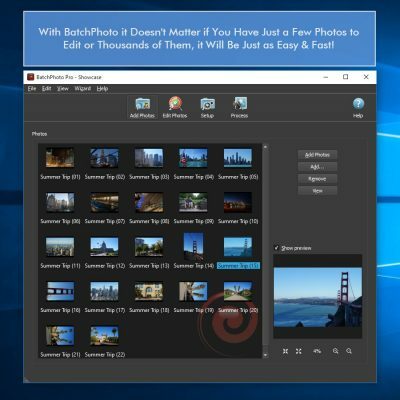 Besides batch editing, Photo Sense offers users the possibility to automatically enhance photos and plenty of options to customize the results. Depending on your needs, the app places at your disposal three workflow alternatives: totally automatic (the only thing you’ll be doing is add your photos and saving the results), semiautomatic and manual, where you can go through your pictures and manually fine-tune them. In terms of image enhancement possibilities, they’re numerous: you can adjust the exposure, contrast, saturation, highlights and shadows, reduce the noise, sharpen your images or boost the clarity. 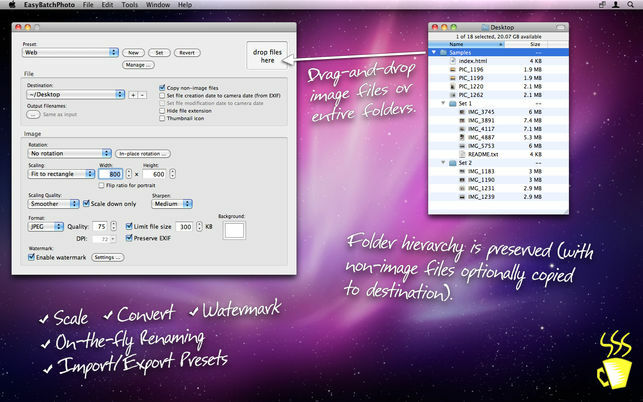 You can also optimize your photos by performing operations like crop, rotate, flip or straighten. Photo Sense comes packed with image effects, which range from classic black and white and sepia to mystic glow, pencil or invert colors. The app also has a series of predefined presets to choose from, and at the same time allows you to create your own presets. Once you’re done editing, you have the option to directly share your collection on various social media networks. If you want to learn how to batch edit photos easily and effectively, this app is definitely worth a shot. Tweak Photos allows you to modify dozens or hundreds of images at the same time with ease thanks to the clean and intuitive interface. 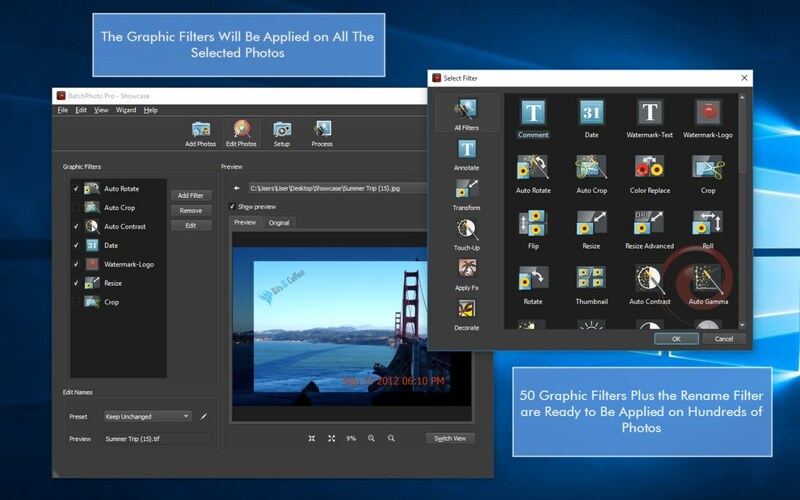 All you have to do is drag and drop your photos, apply your edits and let the program process them. According to your editing necessities, you can automate a large variety of operations. 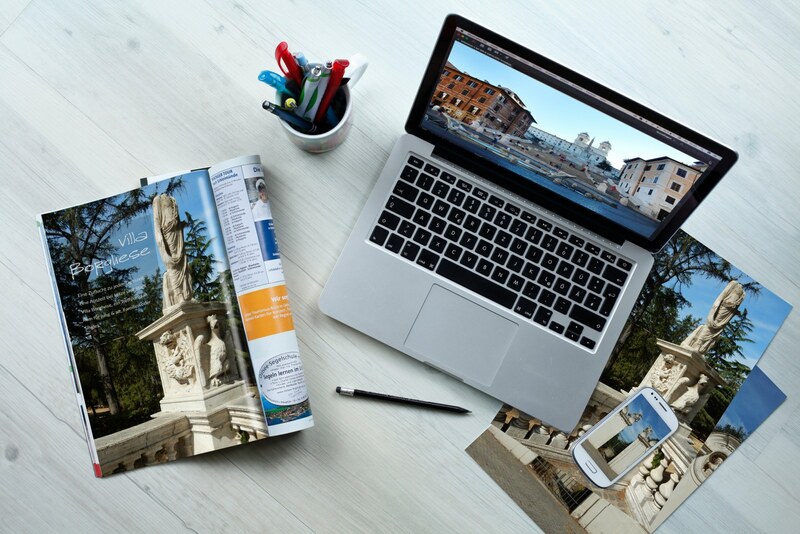 With Tweak Photos you can resize your photos and automatically correct their orientation, crop and watermark them, as well as convert them to popular formats. In terms of retouching, the app lets you adjust basic settings like brightness, contrast and sharpness or reduce the noise. You can also stylize your pictures by applying artistic effects, such as Vignette, Blur or Sepia and by adding various picture frames. 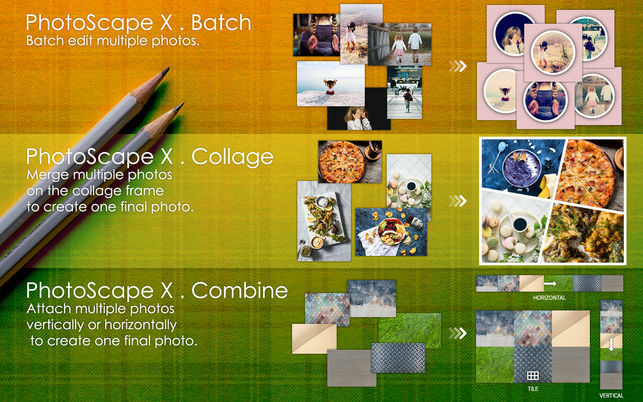 PhotoScape X is a truly interesting and complex batch photo editing app for Mac. 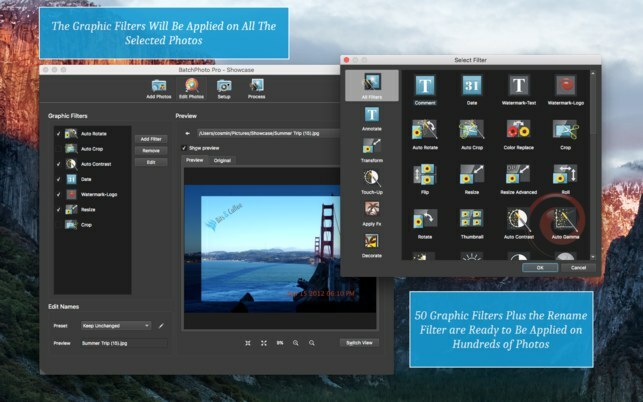 The tool provides users with extensive options to fix images and hundreds of filters and effects to enhance them. Standard optimizing options include edits like resize, straighten, rotate, circular or perspective crop. You can easily go further and resort to the multitude of tools and brushes to perform red eye correction, to remove water and dust spots or wrinkles, pimples and other skin blemishes. PhotoScape X lets you remove the background from your images and also protect them by adding a customizable text watermark. The app comes with multiple filters to create eye-catching pictures. You can boost your photos in bulk by adding light leaks, tilt-shift, HDR, bloom or old film effects and can also adjust settings like contrast and sharpness. 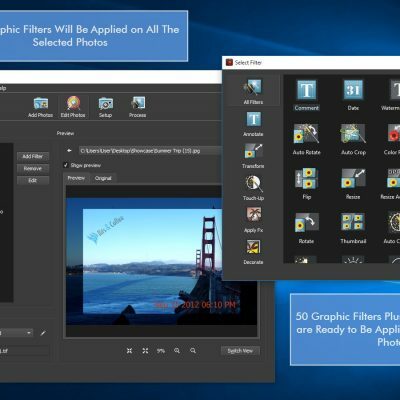 Besides being a batch editor, PhotoScape X can also be used as an image viewer, to create animated GIF’s, to create collages from multiple photos or to capture screenshots. 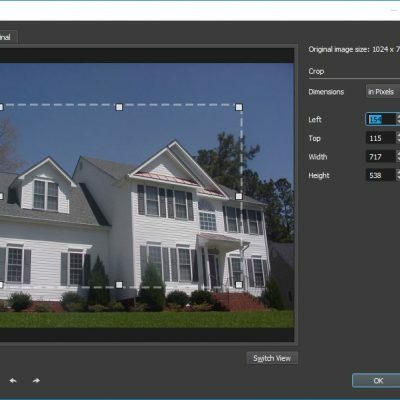 EasyBatchPhoto is a basic solution to edit images in bulk. 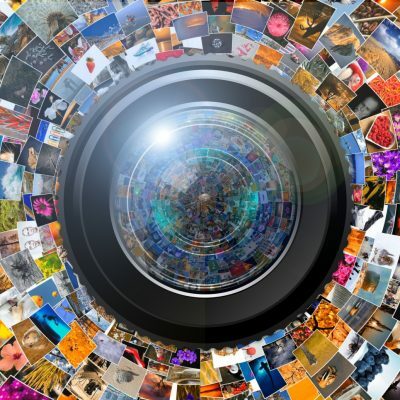 It’s not as rich in features as the previously mentioned apps, but it’s easy to use thanks to the straightforward interface and capable of handling hundreds of images at the same time. The app is perfect for those who need to perform image optimization operations such as resize, crop, rotate, convert or rename. In addition, EasyBatchPhoto enables you to protect and market your pictures by adding customizable watermarks to them. Another useful feature is the possibility to create presets for your tasks, so you won’t have to apply the same edits when starting a new session. 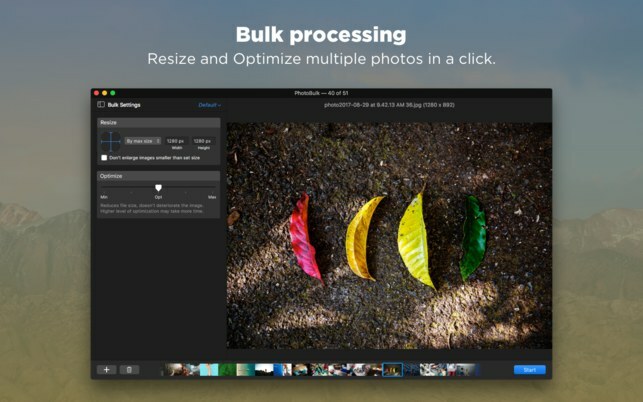 PhotoBulk is our final alternative for batch editing images on your Mac. 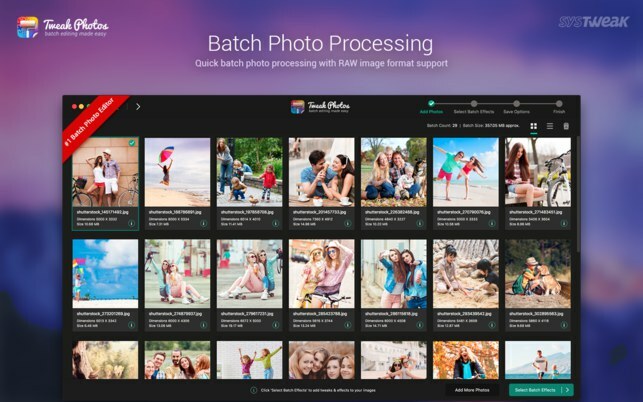 Just like EasyBatchPhoto, it doesn’t provide the variety of features as other apps do, but it gets the job done efficiently if you’re working with a large collection of photos. You can’t perform image retouching edits, like improving the brightness and saturation, but you can protect and brand your photos by using different types of watermarks, resize, rename or convert them. You can also insert the date and time into your pictures and save your settings as presets for increased productivity. Which Mac apps do you use to batch edit photos? You can use the comments section below to let us know about your favorites.